WHAT led me to write this short essay – through which I will try to explain how National-Anarchism first arose and what it stands for and why – was the fact that whilst involved in a discussion regarding the Unabomber with other comrades I came to realize that in Portugal, and in Portugal alone, there is a huge lack of knowledge regarding this vanguard’s ideological current, a current that at least from the perspective of those who run Wikipedia, although very reluctantly, has finally been included as a valid current of Anarchism. 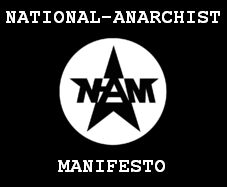 It’s common for National-Anarchists (N-A) to be frowned upon with distrust by the whole political spectrum – both from the right-wing and the left-wing – and even fought back by both mainstream Nationalists (pro-State, supremacist and racist) and mainstream Anarchists (anti-State, egalitarian and anti-racist). Why? Because N-A, even though they agree partially with a few common goals, repudiates the majority of the dogma upheld by both movements. N-A stands out as a revolutionary third way. 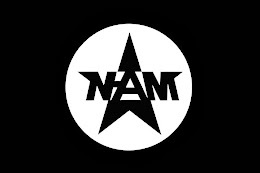 State – N-A, like any other Anarchist current, does not uphold the existence of a ruling state; all decisions must be taken by the local communities, not by a central government and politicians that are not aware of the realities of the people. N-A is also anti-totalitarian, by extension that means it is anti-fascist and anti-communist. Racial supremacy – N-A does not recognize the superiority of any race, whatever it may be, by doing so it does not uphold that Nationalist dogma. Races are different and cannot be compared nor labeled. What is good for one race does not necessarily mean that it is good for another race. What some consider as evolution and civilisation, others find to be abomination and barbarism. Racism – N-A is not racist, it does not discriminate against anyone because of their race, creed or culture. 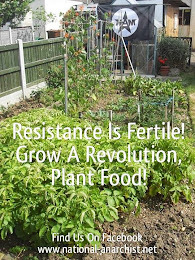 N-A works with revolutionaries from all races, ethnic backgrounds and creeds. Equalitarian – N-A is not egalitarian, it defends the fact that every person is different unto himself, meaning that if I am different from my own brother or my own family it’s only due to an act of imbecility that I would not consider myself to be different from members of other sexual, racial and cultural groups. Each person is an individual, with different capacities; equality does not exist in the real world. Nonetheless, N-A stands for the equality of opportunity. Anti-racism – N-A, even though not being racist, does not uphold the anti-racist dogma that discriminates “positively”. 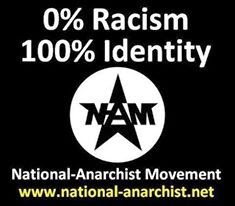 N-A recognises that races exist and that their differences can and should not be fanatically eliminated, as most of the anti-racists believe. Left/Right – N-A has attracted since it’s conception both former leftists and rightists, it is a third way ideology and as such it is beyond left and right, considering both concepts to be surpassed realities. Some of the N-A propaganda upholds that today it’s not an issue of Left versus Right but of the State versus the citizen, of people that support the System and people that fight the System. N-A stands for something that many believe to be pessimistic and/or defeatist, and considering the degree of social degradation that is so deep and rooted we see no way of turning this boat around, if you will allow me to use an analogy from “Ship of Fools”. Drugs, alcohol, MTV and sexual degradation have affected our society in such a way that it is impossible to return to the old days, some even consider those things as a fundamental part of our society. N-A stands for the termination of nation-states, has a necessity for survival and upholds the need of a rebirth of our tribal spirit. All national territories should be regionalised, fragmented, reduced to small territories and within those territories people with common ethnic or cultural affinities will gather together. Our notion of Nationalism is very strict: it covers solely the racial group closer to us (Azoreans, Galicians, Flemish, for example) and also covers the cultural aspects of that group (we also uphold autonomous communities for homosexuals, hippies, vegetarians, Muslims, pagans, etc.) or even the political aspects (autonomous communities for Anarchists, Ecologists, Social Democrats, etc.). N-A above all stands for the right of any individual to live among those whom he feels more comfortable with ideologically, racially and culturally, or by any other identitarian concept that may define him and his people as a group. We should have autonomous and independent communities for each ethnic and cultural group. N-A believes that the racist formula upheld by most Nationalist parties, proposing the expulsion of all ethnic and cultural minorities from our territories is completely unrealistic and surpassed by the real world: there are millions of citizens from other races and cultures living in Europe and, believe us, they are here to stay! So being, the regions where a large concentration of different populations live will have to right to create their own communities and that is nothing new, even the Greeks in old Hellas lived in this way, in autonomous city-states that had different cultures (let us compare Sparta to Athens, just to exemplify this example). 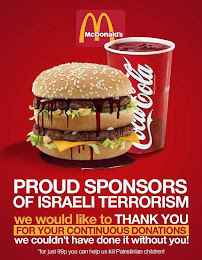 This N-A stance angers particularly the mainstream Nationalists, but we hope that they might gift us with any other more realistic solution, or would they prefer a total civil war or maybe even a policy of genocide? This being said, you are free to consider National-Anarchism as an Utopian ideology. N-A is not an ideology for the present time, it is something that has been created to prepare the ground for tomorrow, when today’s System disintegrate amid all the wars and natural disasters that have started in the last few years. It’s not with joy that we behold today’s world, N-A may very well be the only valid future for the time when it all gets even worse and, believe us, it will get much worse. 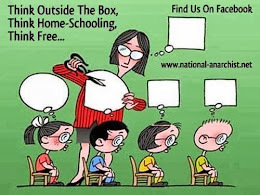 National-Anarchism, at least, tries to be a more realistic option. 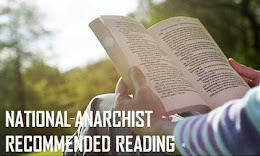 * National-Anarchist Communities: Will I Be Accepted? 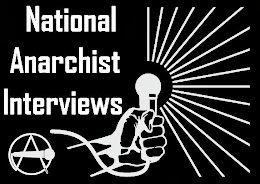 * Race Essential to National-Anarchism? * Will I Be Accepted?